Property show presenter and Conservative policy adviser Kirstie Allsopp has called on the party to consider abolishing stamp duty. She praised Tory plans to scrap the tax for most first-time buyers but urged the leadership to go further to boost the housing market if it wins power. 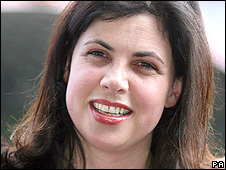 "Abolish it for first-time buyers; re-evaluate it for everyone else," Ms Allsopp told BBC News. But a Tory spokesman said this was her "personal opinion", not party policy. The government has increased the number of shared-equity schemes available to first-time buyers, although much of the help has been targeted at "key workers," such as teachers, nurses and other public servants. In this year's Budget, it was announced they would not have to pay stamp duty until they own 80% of their homes. Conservative housing spokesman Grant Shapps, appearing with Ms Allsopp for a photoshoot at Westminster, backed shared-equity schemes, but he said the take-up had been "disappointing". He said the government had done little to address the cost of stamp duty for the vast majority of first-time buyers, which, thanks to the credit crunch, was becoming even more of a barrier to home ownership. "It is harder than ever for first-time buyers, with people having to raise more money for their deposit," Mr Shapps told BBC News. "Stamp duty is a punitive, one-off payment. We would abolish it for anyone buying their first home for £250,000 or less." But he rejected Ms Allsopp's call to consider scrapping the tax altogether, as it would cost too much and he could not make "unfunded" tax commitments. "Given the amount of money we would be getting from this tax, it would be impossible to abolish it overnight. "First-time buyers are hurting the most, which is why we want to help them. "We would love to go further, but realistically we have to pay for public services." Last year, the government raised £6.5bn from stamp duty, compared with £830m in 1997/98. Properties costing between £125,000 and £250,000 pay 1% stamp duty, those paying more than £250,000 incur 3% stamp duty, and homes above £500,000 pay 4%. Ms Allsopp, presenter of Channel 4's Location, Location, Location, has been advising the Conservatives on housing policy since December. She said: "Getting rid of it [stamp duty] would make it easier to buy and sell houses. "Everyone is paralysed - what we need is movement in the market. We need sales to happen." She said she had paid £750 in stamp duty on the first flat she had bought, for £75,000, but a person buying it now would have to pay £9,750. Abolishing stamp duty for first-time buyers was an important first step - along with other measure such as the abolition of home information packs (HIPS) - but it needed to be "re-evaluated across the board," she added. The Conservatives temporarily suspended stamp duty for all properties worth less than £250,000 during the last property recession in 1991 to boost sales. They say scrapping it for first-time buyers this time would help about 200,000 people a year get on the property ladder, saving them an average of £2,000. In a separate development, the government announced plans to improve the operation of HIPS. These include a new industry-wide set of standards and better information for estate agents to ensure HIPS are available to potential buyers earlier in the process.